Mapping is a common method to put pictures on objects. With simple objects it is possible to use a script. This is demonstrated in this station. 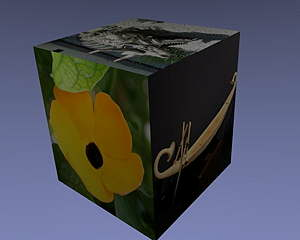 Move the final cube to see all pictures applied. How to animate the cube is shown in an other station. Start the functions and have a look to the resulting output. Replace the images with your own. Alter the code, let one face empty. 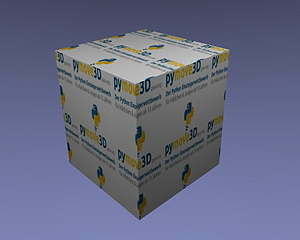 Putting images (2D) on a body (3D) is named UV-Mapping. The letters U and V are used, because X, Y and Z always used for positioning an object in a 3D-World. Like materials textures are managed independent form any object. 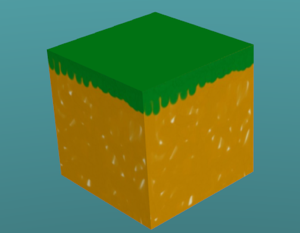 Textures are also never directly connected to an object, instead a material is used. So wie have a chain: texture » material » body.
""" Put image to an object"""
""" Put images to an object"""